3.3 out of 5 based on 185 bloggers and 23 commenters. 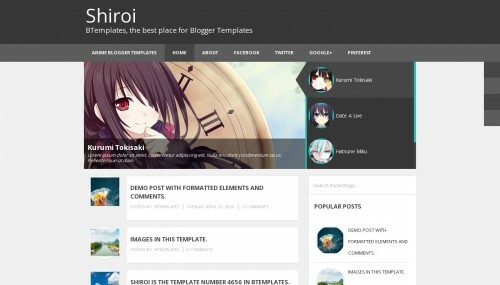 Shiroi is a free blogger template with 2 columns, responsive design, seo friendly, right sidebar, minimalist, an exclusive design for Blogger, slider, social bookmarking icons, posts thumbnails, tabs, breadcrumbs, related posts support, cute design, simple look and neutral colors. Excellent template for blogs about anime, any general topic, to write a diary or a personal portfolio site. I really love this template, but i don’t no how can i put a img on the header (in HTML code). Mas Cool Shiroi Template it. The anime template is nice and steady. Mas there is nothing its anime template. awesome template Thanku for sharing this blog. the bestlah… thanks untuk templatenya. como instalar esse template no WordPress ? The templates you have provided are very useful and attractive to drag more traffic. There is no repetition in the templates you have provided. Great theme i have use this theme for my site.